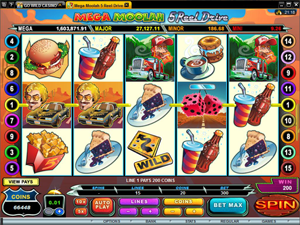 Mega Moolah 5 Reel Drive is a highly-rewarding synthesis of two Microgaming’s slots: the global top-ranked Mega Moolah progressive and a non-progressive 5 Reel Drive. The ensued game features the American open road theme and offers a life-changing jackpot up for grabs for every player. No matter what your bet size is! You are eligible for a progressive every time you make a spin, with no ifs or buts about it. This is a five-reel fifteen payline progressive slot inspired by the spirit of the open road with never-ending highways and roadside cafes. Low- and mid-paying symbols in the slot are the fast foods served at any roadside restaurant; these include coffee and a doughnut, a piece of blueberry cake, a cold drink, crisps, French fries, and a cheeseburger. The food symbols award x6 to x600 times a bet for three, four or five matching symbols on an enabled win line. High-paying icons incorporate rearview mirror dice, a blue car, a yellow car and a red car. Get 2–5 lined up across an active payline, and grab x7 to x1000 times a bet. The highest-paying symbol is the Flaming Wheel symbol. Get five of them on an activated payline, and you win a 10,000-coin fixed jackpot! A coin is available in three denominations: $0.01, $0.02 and $0.05. The number of coins per line is tuned from just 1 to 15, which translates into the maximum wager of 225 coins, or $11.25, per spin, making the game suitable for any budget. The Curvy Road Sign represents a wild symbol that can create a winning combination by substituting for the symbols that are missing. A wild can occur on three middle reels only. 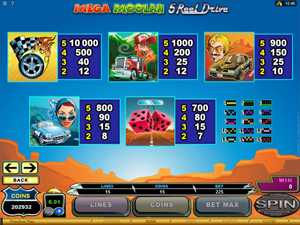 The Mega Moolah 5 Reel Drive slot is equipped with a scatter symbol that comes in the form of a police car. If three, four or five cars come scattered in any position on the reels, you win ten free games with all combos awarded x5 times their normal paytable value. 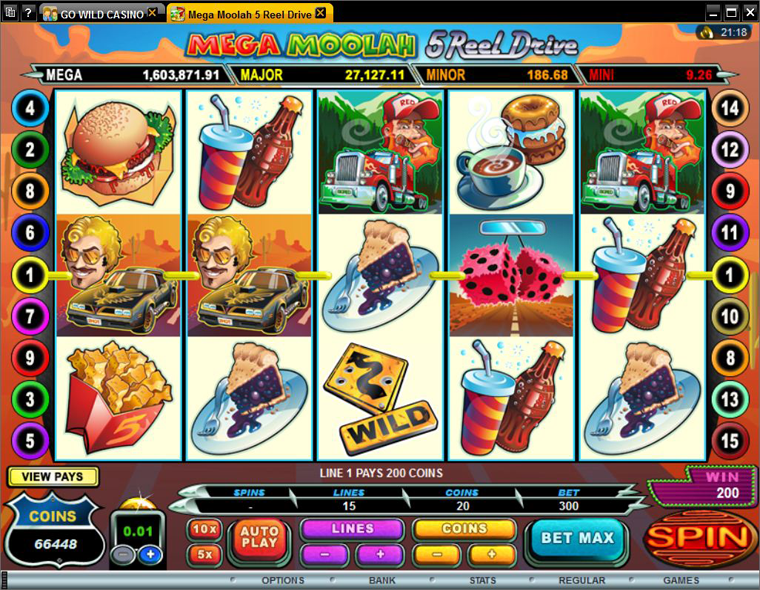 The free spins can be retriggered by 3+ police cars during the feature play real pokies online. In the Jackpot Wheel feature, you will see a wheel divided into sections of four different colors, each standing for a different type of progressive jackpot. You have to spin the wheel, and after it stops, the pointer will determine which jackpot you have just won. The Mega Moolah 5 Reel Drive is a phenomenal progressive slot with great graphics, frequent payouts and a x10,000 fixed jackpot. Apart from offering a fantastic millions-worth progressive, it features all basic attributes one would expect to see in a modern five-reel slot machine, such as wilds, scatters, free spins, etc.